Any frozen dessert can be negatively affected if not handled or stored properly. This is THE tool no gelateria or ice creamery can live without! Meet the ultimate container for your frozen treats. From transport, storage to display and serving – the standard 5 litre silver container is an absolute essential for your products. 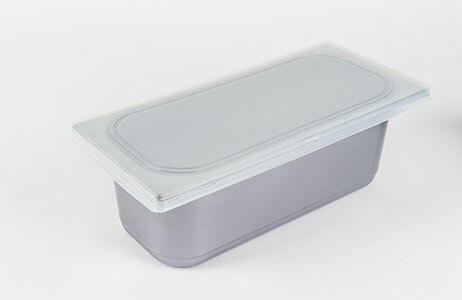 Ideal for freezer displays, or general storage. 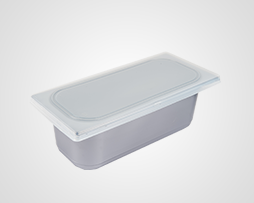 Both functional and presentable, these rectangular heavy-duty pans with disposable lids are compact, ensuring proper storage for gelato, ice cream, frozen yogurt, sherbets or sorbets, and help keep your cases nice and neat. 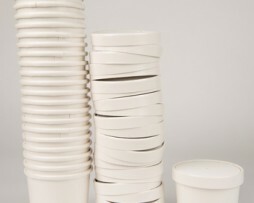 They come in a standard size, able to fit most gelato cases and dipping cabinets. This pallet comes with 1600 silver containers with narrow, tight-fitting flat lids, providing airtight storage that helps keep the flavour and texture of the gelato or ice cream intact. Food grade and industry-standard quality that your gelateria or ice cream parlour can use for years.